Cision’s annual survey of more than 1,550 North American journalists and influencers reveals that while most consumer trust reports indicate that people have more faith in earned media than paid and owned, journalists perceive they are now struggling to maintain the public's trust. Despite being the most trusted medium, confidence in the media eroded due to the presidential election and other factors. 2016 was a monumental year for news and the journalists and influencers who covered it. The results of this year’s survey indicate that journalists, publishers and brand communicators need to continue to provide relevant, authoritative, accurate content to the public in order to preserve and rebuild consumer trust. Accurate public statements, press releases, brand images, videos and data enable journalists and influencers to tell better stories, deriving facts from trusted and vetted sources. When communicators pair compelling messages and format with pitching best practices and prior knowledge of a writer’s work, they can drive better and more accurate coverage and increase earned media opportunities. Another 2017 trend shows the market moving away from sponsored content and native advertising and towards mobile compatibility, video and image-based content, social media as a journalistic resource and influencer marketing. Journalists want story ideas from credible industry experts and to gather ideas and news from services like Help a Reporter Out (HARO), PR Newswire for Journalists (PRNJ) and ProfNet. Media challenges show that a combination of lack of resources and the fast pace of new media is pushing some writers and publishers out of the industry. Journalists are being asked to do more and with less resources, often being forced to make cuts in fact gathering and investigative journalism. The disruption of media business impacts journalists' productivity and performance, making the relationships between brands, trusted newswires, journalists and influencers even more vital than ever. At a time when 81 percent of senior marketers believe earned media is more effective than paid media, communications executives are starting to recognize the power of earned media to share their brand’s message and to increase market share in this changing consumer climate. The fact that corporate brands are more trusted today than either the government or the media gives them a unique opportunity to help shore up the media’s credibility. Executive brand voices hold more of the public’s trust than the media which is a complete role reversal from a few years ago. Despite the fact that many perceive journalistic outlets in the modern era to have an obsession with being “first,” media professionals overwhelmingly disagree with that presumption. More than ever, journalists and influencers value accuracy over speed. Ninety-two percent of respondents said that being right is more important than being first, up four percent from 2016. (click to tweet ) Influencers this year aligned more closely with journalists from last year, with 13 percent of respondents saying they think being first is more important. Because being right is viewed by journalists as being more important than being first, it’s understandable that 60 percent of reporters believe the public values facts over opinions or feelings. 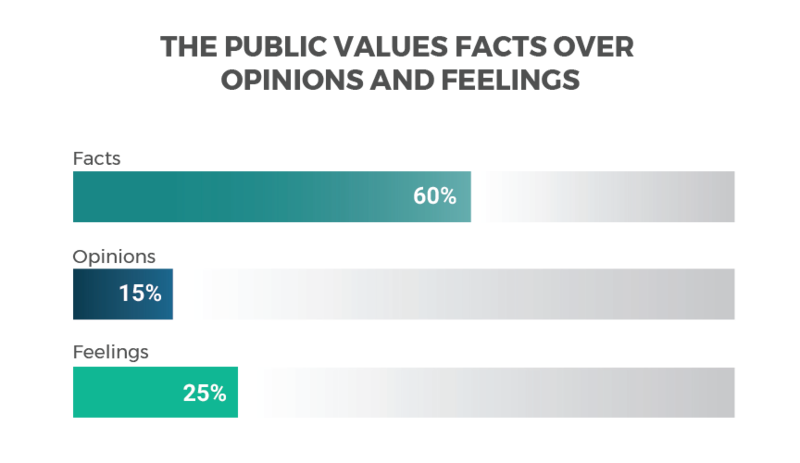 Just 25 percent of journalists said they think the public values feelings the most. Regarding the importance of facts, feelings and opinions, influencers were split. Thirty-three percent stated that feelings were most important to the public and 28 percent said opinions held the most sway. 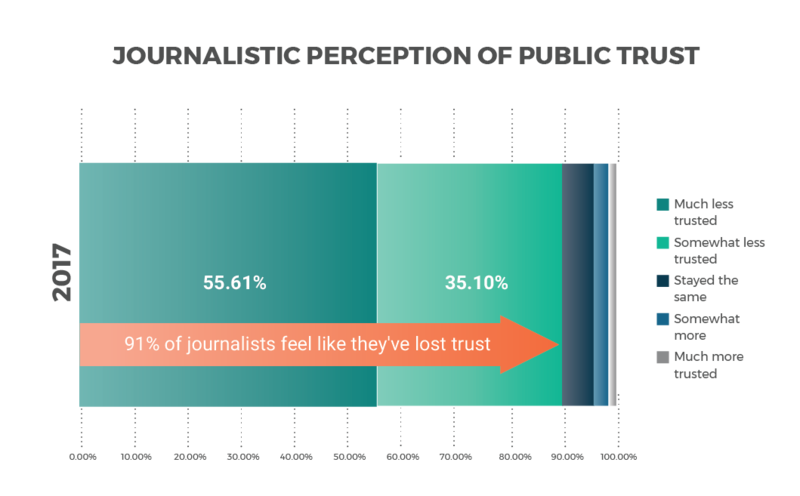 How Can Journalists and Publishers Increase Trust? Journalists want news outlets and publications to focus more on fact-based reporting than opinion-based coverage. In the 829 fill-in-the-blank responses received, the word “facts” was used in 23 percent of the responses, followed by “accurate” 14 percent of the time, and “sources,” 11.58 percent. Journalists and influencers particularly dislike being contacted via telephone, with an eight percent uptick of respondents who said that telephone pitches are strictly off limits. What Makes Journalists Pursue a Story? Newsworthiness and relevance to a journalist’s audience are critical to gaining a journalist’s attention. The topics that communicators pitch to a journalist or influencer are more important than how the story is pitched. This year, more than half of respondents said displaying knowledge of past work, interests and beats is what drove an influencer or journalist to pursue a story. 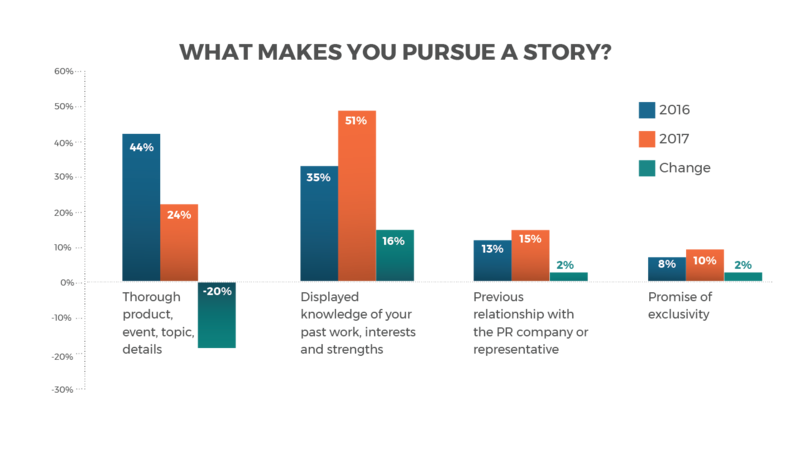 Twenty-four percent of influencers and journalists said that providing product, event or issue details caused them to pursue a story. Both exclusivity and an existing relationship with a PR agency or representative continued to play roles in what actually drives coverage. The message is loud and clear: if brands want to get a journalist’s attention, then brands should show that they understand his or her beat and interests by pitching a story that fits both. Despite the relationship being far from perfect, journalists continue to rely on public relations professionals for story sources. 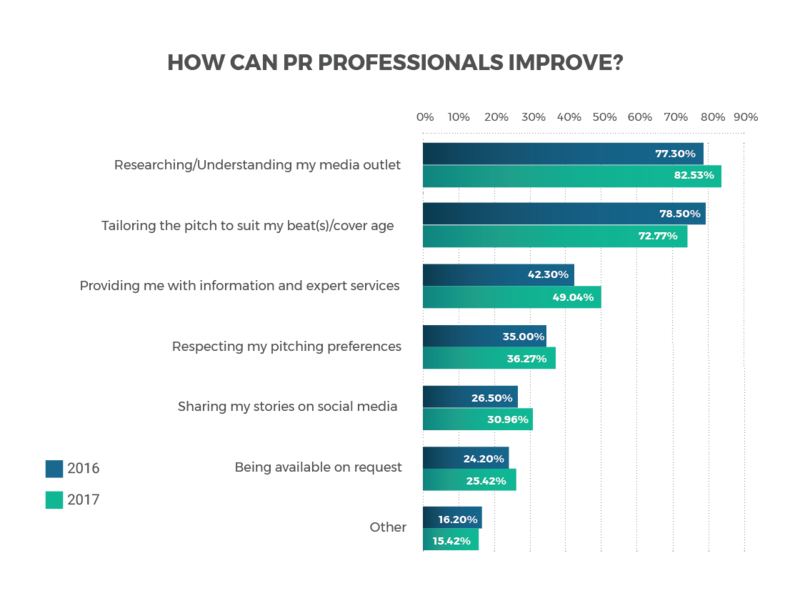 The largest proportion of media, 63 percent, said their reliance on PR professionals has not changed. 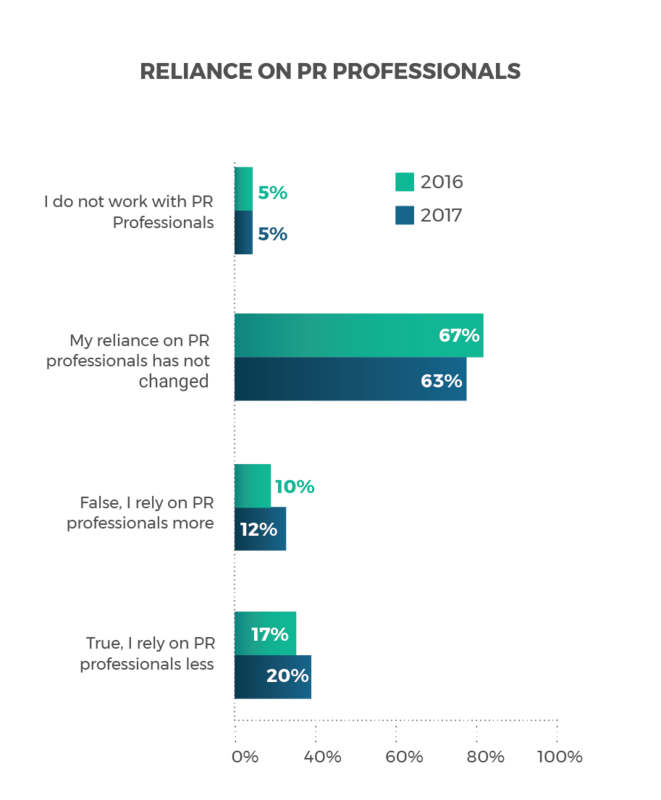 Twelve percent of respondents said they rely on PR professionals more than they used to, compared to 20 percent who said the opposite. This year Cision connected with more than 350 bloggers and social media influencers and this group is even more polarized, with 18 percent saying they rely more on PR professionals. Influencer marketing is still an emerging industry and an enormous opportunity for public relations professionals, but it is maturing quickly. As the ethics and processes of this new practice continue to evolve, public relations professionals will play an integral role in shaping the industry. Influencers faced challenges this year with the Federal Trade Commission cracking down on disclosure rules and issuing fines to brands who fail to have their influencers declare their sponsorships. Separately, one of the world’s largest content marketing and influencer marketing companies, Mode Media, went belly-up. Professional communicators will continue to play an integral role as intermediaries between brands and influencers, and should help ensure influencers receive compensation for their work and that the work they do is within the confines of the law. How Can PR Professionals Improve? PR professionals should write angles that are less commercial and more usable for general audiences. Agencies and brands should produce in-house B-Roll and sound clips relating to timely issues, especially visuals or videos of a work site or a specific product’s use. If you are willing to write and distribute a press release you should be willing to reply to a few questions from journalists. Write in AP Style, or at least spell things properly. Stop spamming journalists and stop calling to follow up after spamming them. With real-time media channels and live video outlets such as Facebook Live growing in popularity, today’s media professional needs to be an adroit digital content generator. State of the Media findings show that Facebook has become the leading audience engagement tool. (click to tweet ) Twitter remains persistent as well, with journalists believing it has the greatest opportunity for growth. Journalists are including social posts in their articles almost as often as they insert images, and more often than they include videos. 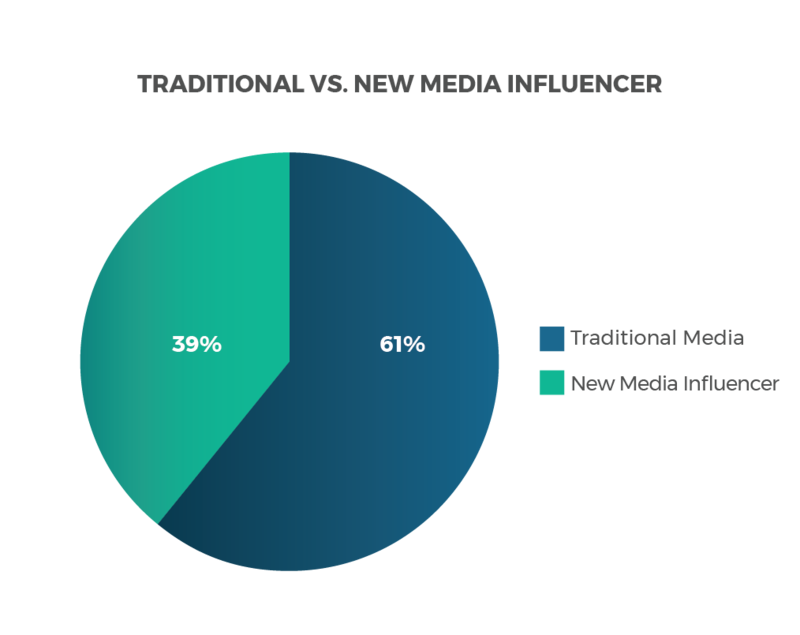 The need for brands to communicate across multiple channels has grown in importance with the rise of independent media influencers such as bloggers, podcasters and social media personalities. 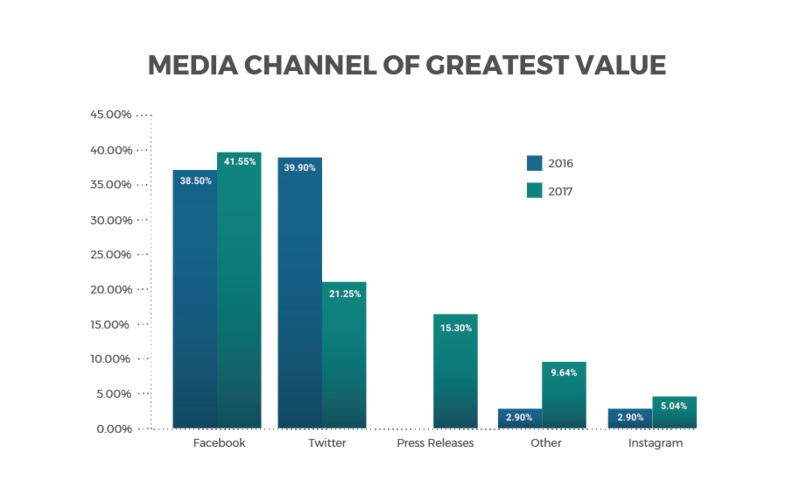 As trust in traditional media drops, influential individuals become more important in the communications ecosystem. 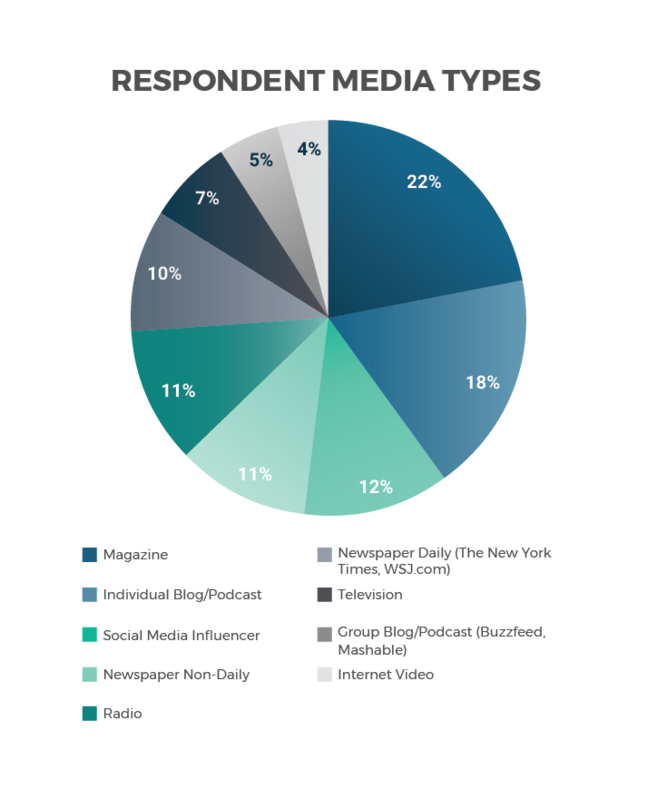 More than one-third of survey respondents are from non-traditional media such as blogs, podcasts or social media publishing, while about a quarter of respondents write for magazines. Only when brands communicate across both traditional and digital channels can they expect to reach the same volume and diversity of audiences that they reached in the past. Twenty-one percent of respondents cited Twitter as the channel with the greatest potential for growth. A Poynter study from 2015 revealed that journalists are the largest and most active group of verified users on Twitter. Because many people use Twitter as a means to understand what’s new from their favorite content sources, it makes sense journalists would see such potential. Although journalists are optimistic about Twitter’s potential, the company continues to miss revenue targets, driving its stock below $20 for much of last year and into 2017, fueling speculation that the platform may be acquired by a larger, more profitable player. At the same time, Twitter could not be more visible, with President Donald Trump using the platform to communicate regularly with the public. Although Snapchat did not rank as an important engagement tool, six percent indicated it has the most potential for growth — more than double the result from 2016. Is Social Media a Reliable Source for Information? Journalists may be using social media posts in their stories, but that doesn’t mean they automatically trust these sources for the content they include in their articles. Social media has become a staple in the diet of a media professional. Despite the potential, the majority still use it mainly as a medium to share and broadcast their content to followers. 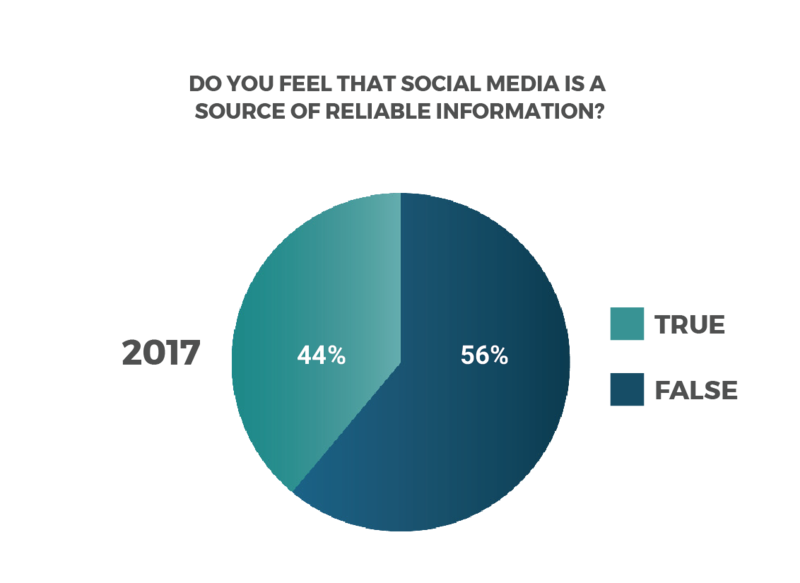 In fact, State of the Media respondents may have lost trust in information shared on social media, with 7 percent fewer agreeing that social media is a reliable resource for information than last year. Canadian respondents and influencers were more favorable of social content, with 61 percent of influencers indicating that social media is still a valued resource. Almost half of respondents say they do not use new video features of existing social platforms. 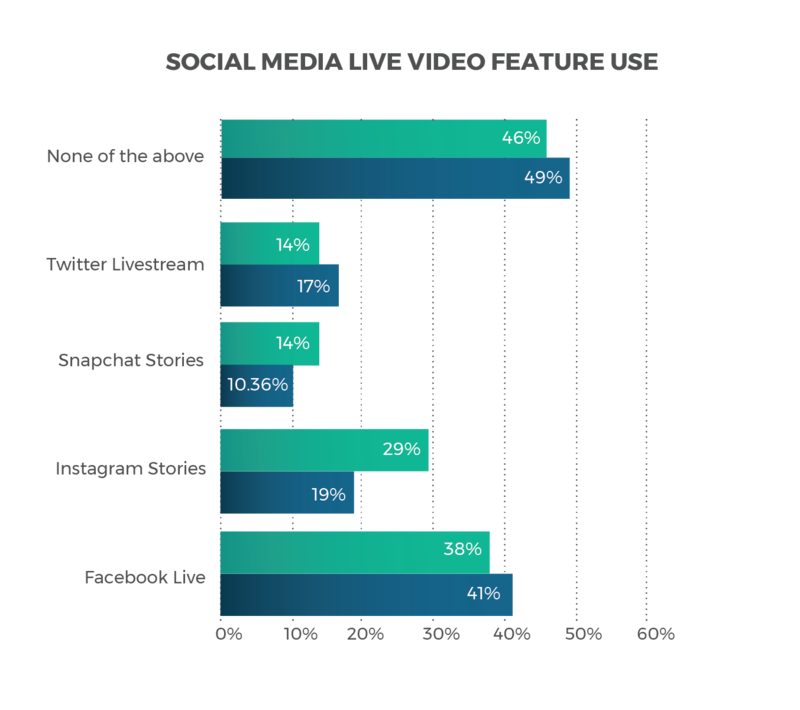 However, of those who use video, 41 percent say that they use Facebook Live, 19 percent are using Instagram and 17 percent have used Twitter’s livestream features. (click to tweet ) This might be an untapped medium for media professionals. Twitter recently told shareholders it had 31 million unique viewers watch more than 600 hours of live video across 400 events between September and December. Twitter Livestreams included political debates, football games and concerts produced by major media outlets and sponsored by premier brands like Pepsi. Regardless of new entrants into the live video market like Facebook Live and Instagram Stories, YouTube’s strength persists. Research by the UBS Evidence Lab found that 36 percent of internet users viewed live video in the second half of 2016. Of those, 21 percent watched that content on YouTube and only 14 percent did the same on either Facebook Live or Snapchat Live Stories. Influencers and bloggers had a similar rate of video usage and were 10 percent more likely than journalists to use Instagram stories. Live social media content is a new medium which requires its own expertise and an engaged social audience. However, half of State of the Media respondents do use these new tools and PR professionals can pitch live content ideas to journalists just as they do traditional articles. This year’s research indicates that media professionals and journalists are trying to make their stories and content more interactive. When asked which multimedia or data elements they have included in articles over the past two to three years, results show journalists are now more likely to use images, videos, infographics and user generated multimedia than data assets. Photos and social media posts rank first and second as the most popular forms of media used. This is why it is critical for brands to execute a data-driven, multichannel content strategy that includes social media. One of the first places journalists visit when a brand experiences a crisis is a company’s social media channels. If brands are unresponsive on social during a crisis, the media may publish damaging social media mentions. Despite the growing popularity of varied social media elements, photos are still the most often used. State of the Media respondents said they “always” or “often” use multimedia elements 70.5 percent of the time, compared to their use of data which respondents rated at 56 percent of “always” or “often” usage. Cision also found that journalists rely more on newswires and stock imagery and less on staff photography as assets for their articles than compared to last year. Where do you most often get your image and video content? To increase the relevance of the images provided to journalists, communicators should include photo credits and captions which clearly describe a photo’s content, as well as the dateline city and the source (who is responsible for the news and images). By including images in a release or a pitch, PR professionals can both increase its relevance and the likelihood that it will get picked up. This insight is reflected in other key media research as well. A 2015 study by PR Newswire found that only 42 percent of press releases included multimedia elements, and of the top 100 most visited releases on the site, 68 included photos or videos. Journalists are more prepared today to engage in a digital-first environment and they see sponsored content and native advertising as less important than last year. When asked to explain their choices, the issues most often mentioned included the drive towards mobile readership and an increase in video requirements based on readers’ demands. While multimedia is important, journalists are still looking to public relations professionals to get the basics right. Cision asked journalists to rank which PR resources they found most valuable. For the second year in a row, press releases and story leads ranked first, followed by expert interviews and images. (click to tweet ) Video rose one spot from fourth to third most valuable, while products to review dropped in importance. Among bloggers, however, products ranked as the second most valuable resource. Assistance in story writing ranked last across the board. Journalists still need compelling story ideas from communications professionals and they need the credibility provided to them by organizations, executives and experts. With less time and more reliance on trusted brands to provide accurate stories, newswires like PR Newswire with access to PRNJ and pitch databases like ProfNet and HARO are a critical way for journalists to gather news they can trust. When journalists were asked to explain what they see as the greatest challenges for the media this year, many respondents doubled down on the concept of regaining trust, the rise of misinformation and fake news. Some of the responses also lamented the fact that many media professionals fail to fact-check stories that they follow up on after another outlet was first to publish. “If media organizations don’t fact-check each story independently as it develops then articles can take on the air of truth from repetition,” a daily newspaper reporter in Washington, DC said. “Just because another news outlet published a report, that doesn’t remove your organization’s responsibility to independently fact-check the findings.” Reporting that another outlet is publishing something helps spread falsehoods and if a story isn’t verifiable, journalists shouldn’t be giving that story airtime. Another issue is purely around setting the proper context high up in a story. For example, a podcaster from California said publications have a duty to inform readers in the headline when a public figure makes comments that are not verified. For years now, journalists have had to endure shrinking news teams and constricting budgets, and comments in the State of the News Media report show that journalists worry about these changes. Veterans with years of domain knowledge have in some cases exited the business. The influx of newer talent might be cheaper than their predecessors, but the level of depth with which they may pursue a story has changed to suit business needs. Some journalists feared that a loss of ad revenue and journalism resources have driven down the quality of work, which has enabled some facets of the media to grow while also leading to a decline in professional standards. An independent publisher from Chicago believes a combination of lack of resources and the fast pace of new media is pushing some writers and publishers out of the industry. As the traditional media pool shrinks or evolves, it’s more important than ever that communications professionals know which media professionals they are targeting and that the topics are most important to them. This can be accomplished by having a persistently maintained media database, and having a way to automatically track what stories those influencers write or are interested in creating. 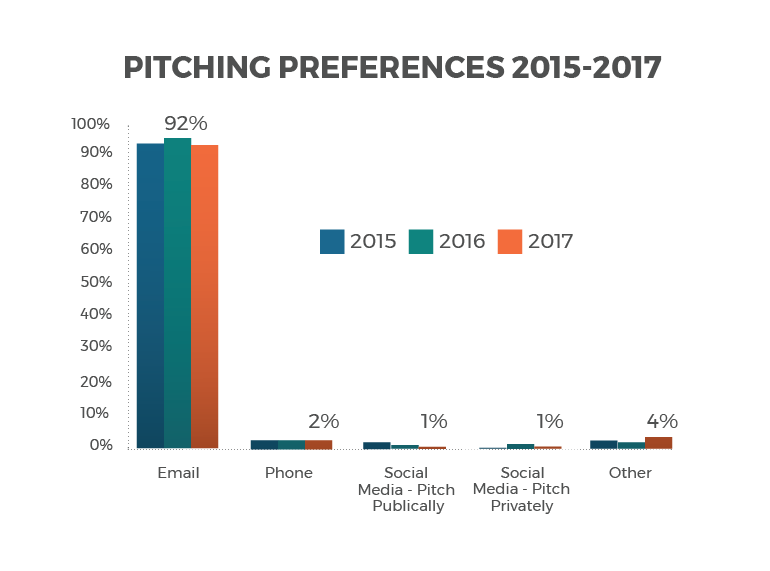 In doing so, public relations and communications professionals can move from “spray and pray” pitching approaches to hyper-targeted, relevant engagement with their influencers. A brand’s sphere of influence has never been as complex and onerous to manage. Even in this strange media climate, reporters, producers and editors can unlock enormous potential for reaching audiences, impacting opinions and driving value. When communicators know more about who they are pitching, what reporters need and how to help them get ahead, brands can build trust and nurture relationships. About the Cision 2017 State of the Media Report Cision conducted its 2017 State of the Media Survey during a three-week period between January and February 2017. Surveys were emailed to members of the Cision Media Database, who are vetted by the company’s media research team to verify their positions as media professionals, influencers and bloggers. This year’s survey collected more than 1,550 responses from journalists, editors, influencers and producers. Of those, 200 work in Canada and 1,350 work in the United States. Of these respondents 960 are traditional media professionals, such as reporters, editors, producers, radio hosts and broadcasters. Of the non-traditional media professionals, 340 identified themselves as bloggers while 250 respondents identified as Internet video and social media publishers. About Cision Cision is a leading media communication technology and analytics company that enables marketers and communicators to effectively manage their earned media programs in coordination with paid and owned channels to drive business impact. As the creator of the Cision Communications Cloud™, the first-of-its-kind earned media cloud-based platform, Cision has combined cutting-edge data, analytics, technology and services into a unified communication ecosystem that brands can use to build consistent, meaningful and enduring relationships with influencers and buyers in order to amplify their marketplace influence. Cision solutions also include market-leading media technologies such as PR Newswire, Gorkana, PRWeb, Help a Reporter Out (HARO) and iContact.